…So Holi season is here peeps! I absolutely Holi. It’s such a happy time altogether. I find it much better than Diwali which has become more of a nightmare due to the obligatory gifts and presents that need to sent out to pretty much every living soul you’ve ever come across in this life. Most people have anxiety attacks thanks to the never ending bills they have to face at the end of the “Diwali month”. But Holi isn’t fussy like that! It’s fun, safe and most importantly amazing food! So I tried making Gujiyas for the first time. Although in my family we make gujiyas at home every year. My grandmother makes 300 Gujiyas in one go :O. But it was the first time for me. I think they turned out pretty well. I’m going to be sharing the recipe with you all so you all can try it at home as well. Before starting, please remember that making a Gujiya is a tricky affair. You can screw it up majorly if you don’t do it right. There are so many things that can go wrong in the process. But I’m going to share my experience and some tips that will hopefully help you avoid those loopholes. Either Refined Oil or Ghee, your choice. First of all, Sift your Maida in a big bowl or a plate. Add a little water and mix well till soft lumps are formed. Add all your ghee and mix again. You’re gonna have to mix really well (and put in a lot of muscle power) because we don’t want to add in too much liquid in the dough. Once your dough starts to come together a bit, add a little more water and mix again. If, at this point, your dough seems firm, do not add more water. But if chunks are falling apart then add a teeny weeny bit more. 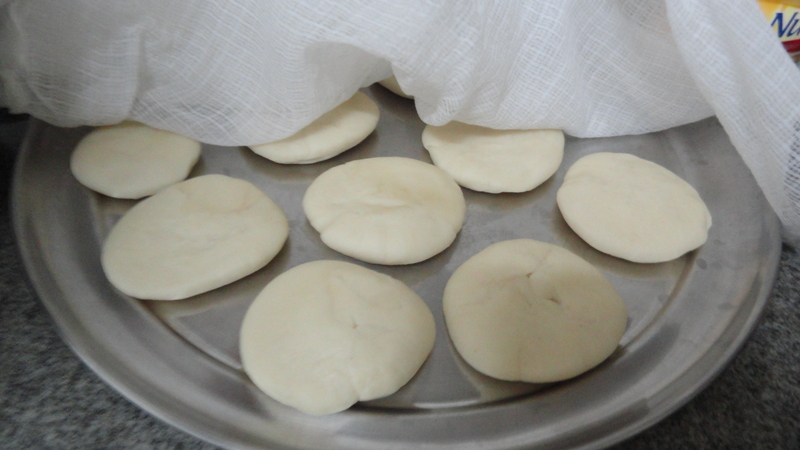 Once your dough is set into a huge ball, cover it with a cloth and set it aside. For the filling, take your Khoya and fry it on a Non-stick pan till it turns light golden. Take it off the stove and transfer it to a bowl. Let it cool for about 3 minutes. Add your powdered sugar and mix well. 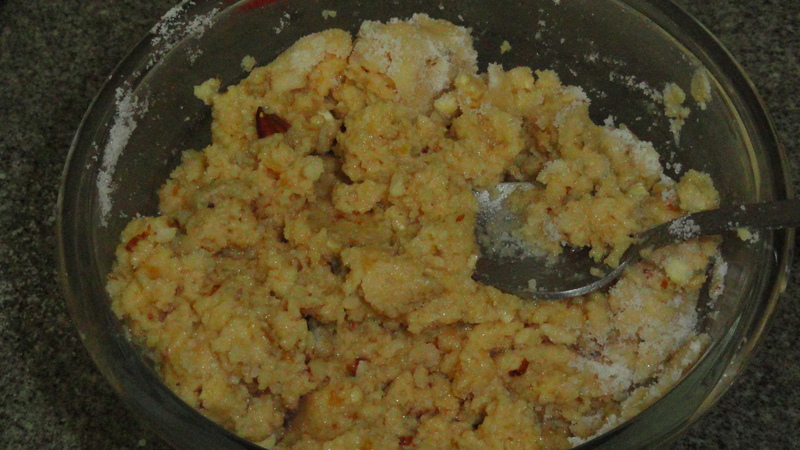 Now add your cashewnuts, almonds and desiccated coconut all at once and mix well. Now take some water in a small bowl and put it on a medium flame. Add the Kesar and chopped cardamom to the water. Now cover it with a small lid and leave it on the stove for about 5 minutes. After 5 minutes, remove it from the heat and strain the water into your filling mixture. Mix well. Now Roll the dough balls into small puris. Take the first puri and put it on the mould. VERY IMPORTANT STEP HERE: Touch the edges of the mould with a little amount of water so that the gujiya does not split open while you’re frying it. Dip your finger into water and softly run it across the edges of the mould. Now shut the mold tightly and remove the protruding bits of dough (Those bits will be used later to make more gujiyas) Now remove the gujiya from the mold and cover it with a cloth. Make a full batch of Gujiyas (20-25) and keep them all covered. Now warm the Oil (or Ghee) at medium heat until it starts to crackle. 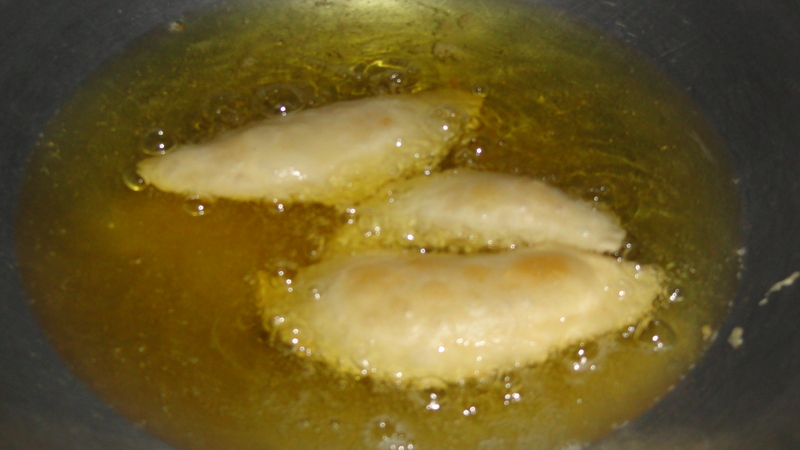 Gently place two or three gujiyas at a time and fry at a medium heat only. Fry them till they’re light golden. Remove from heat one by one and place them on a plate. Follow the same process with the other gujiyas. Your gujiyas are ready to serve! 1) Always remember to make sure that the dough is neither too dry nor too wet. In fact in this case I would suggest that it’s better to have them a bit on the dry side. 2) Always use water for the edges of the gujiyas while molding them. 3) Never fry at high heat or low heat. Always at medium heat. 4) Always keep the dough covered. 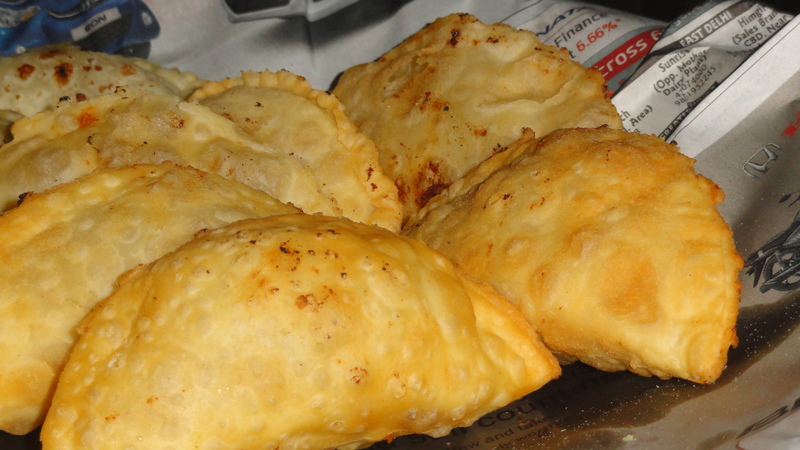 5) Do not fill the gujiya with too much filling or else it will burst.